It is a pervasive proposition of Oregon winemakers, whose red grape of choice is generally Pinot Noir, that their wines are created on the Burgundian model. One producer whose Pinot Noir might actually be taken for Burgundy, in both style and structure, is WillaKenzie Estate. The heart of Burgundy’s wine production, the celebrated Côte d’Or, lies at roughly the same latitude as the core of Oregon’s wine production, the Willamette Valley. That fertile basin extends some 100 miles from Portland in the north down to Eugene. It is the source of more than 80 percent of the Pinot Noir wines made in Oregon. 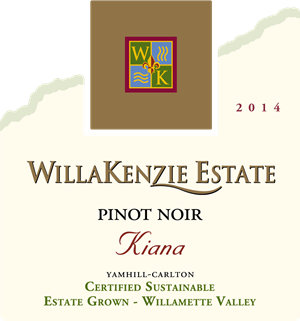 WillaKenzie, which takes its name from the sedimentary soil type found near the confluence of the Willamette and McKenzie Rivers, recently offered a cross-section of its Pinot Noir at a Chicago tasting. The half dozen wines fell into two general styles analogous to Burgundy Pinot Noir. Three wines, light in hue and medium bodied, suggested the Pinot Noir produced in Beaune or perhaps Santenay in the central Côte d’Or; an equal number of darker, more imposing wines brought to mind the Pinot Noir of northerly Burgundian locales like Vosne-Romanée and Gevrey-Chambertin. Longevity was a linking character of the three more posh wines. The WillaKenzie Pinot Noire Pierre Léon 2013 completed that triptych in noble fashion. The Pierre Léon was striking for its luscious dark fruits and a hint of coffee, but also for its elegance, a fine balance between rich flavors and acid-supported structure. This is wine with serious life expectancy. ($55).